Well the Leafs’ season is almost over (3 games left? ), although for many of the veterans and those that have been with the team for more than a year, it was done much earlier than now (JvR, Lupul, Hunwick, Kadri were all shut down due to injuries & etc). This year was meant to be a rebuilding year so nothing was expected of the team. At the same time, it was hard to get enthused about the team – I hardly watched any games, but I kept up to date with blogs. I’m not sure if the Leafs will get the 1st overall draft pick. It would be nice to draft Matthews as a franchise 1C but I hear the other picks are pretty promising too. We’ll see what happens – next year the expectations will be higher on the team. Maybe the kids will compete for a playoff spot! A look at the computer science professor who is famous because he invited :-). However, what he truly wants is to be known for is solving general AI. If you live in the Pacific Northwest, you might be thankful that you don’t live in SF and have to worry about the danger of a huge earthquake – actually, that’s not true because you’re sitting on an even larger fault! This article has colorful descriptive language of what might potentially happen should a potential 9.0 earthquake hit. A grown man is knocked over by ankle-deep water moving at 6.7 miles an hour. The tsunami will be moving more than twice that fast when it arrives. Its height will vary with the contours of the coast, from twenty feet to more than a hundred feet. It will not look like a Hokusai-style wave, rising up from the surface of the sea and breaking from above. It will look like the whole ocean, elevated, overtaking land. Nor will it be made only of water—not once it reaches the shore. It will be a five-story deluge of pickup trucks and doorframes and cinder blocks and fishing boats and utility poles and everything else that once constituted the coastal towns of the Pacific Northwest. The story of a key member of FlyerTalk, how he got into the hobby of gaming frequent flyer programs, and a little bit about how he spends his life. Schlappig is giving me this economics lesson while he waits in the spa of the first-class Virgin Atlantic Clubhouse in JFK Airport in New York. He has been up all night, downing eight cups of coffee and typing blog posts the entire flight; he maintains a militant work regimen, blogging only on Eastern time, jet lag be damned. “I think he’s not a person who was meant to work from nine to five,” says his mother. “Now he probably works 18 hours a day.” Schlappig is chatting through a complimentary massage, enjoying the elbow in his back from a plump spa therapist and straining occasionally to sip his dry gin with crème de mûre. She chats him back, smiling, and asks how he’s been — Schlappig knows almost the entire staff here by name, and he schedules his globe-trots to make a pit stop here every few weeks. I remember following this news story in detail because it was about an Asian family in Toronto. Now that the trial is over, there’s a lot more information about what happened – and this account is even written by someone who went to the same high school as Jennifer Pan and her boyfriend. Jennifer’s parents assumed their daughter was an A student; in truth, she earned mostly Bs—respectable for most kids but unacceptable in her strict household. So Jennifer continued to doctor her report cards throughout high school. She received early acceptance to Ryerson, but then failed calculus in her final year and wasn’t able to graduate. The university withdrew its offer. Desperate to keep her parents from digging into her high school records, she lied and said she’d be starting at Ryerson in the fall. She said her plan was to do two years of science, then transfer over to U of T’s pharmacology program, which was her father’s hope. Hann was delighted and bought her a laptop. Jennifer collected used biology and physics textbooks and bought school supplies. In September, she pretended to attend frosh week. When it came to tuition, she doctored papers stating she was receiving an OSAP loan and convinced her dad she’d won a $3,000 scholarship. The most interesting thing about this article is how it breaks down the one word “Privilege” into different types of privilege. The generalization is overused, so it’s more interesting to think of how a person or a group is privileged compared to society – not all privilege is the same. I, maybe more than most people, can completely understand why broke white folks get pissed when the word “privilege” is thrown around. As a child I was constantly discriminated against because of my poverty, and those wounds still run very deep. But luckily my college education introduced me to a more nuanced concept of privilege: the term “intersectionality.” The concept of intersectionality recognizes that people can be privileged in some ways and definitely not privileged in others. There are many different types of privilege, not just skin-color privilege, that impact the way people can move through the world or are discriminated against. These are all things you are born into, not things you earned, that afford you opportunities that others may not have. In years past, I considered buying a Leafs jersey. The player I would have picked on the back would be Kessel, because I thought he would be a Leaf the longest – maybe not his entire career, but like Iginla, he would be on the team for a significant amount of time that his career would be identified as being with the Toronto Maple Leafs. When Kessel signed his 8-year contract extension, even amidst worries and criticisms about his defense and training regime, it seemed like this would happen. Alas, I never bought a jersey, and that actually might be good news. Kessel is on the trading block, not because of his ability or his contract (which while large is worthy of his talents), but because his prime hockey years don’t align with Toronto’s rebuilding process. I think our rebuild is important, overdue, and should be done right. Unfortunately it looks like Kessel’s career with Toronto might be a casualty. It’s sad, but hopefully we will get some picks & prospects for him. Let’s see what happens in the next week or so! Scarborough received some English-world press this month when food blogger Tyler Cowan (more well known in his alter ego as an Economist or as blogger on Marginal REVOLUTION) visited it and raved about the quality and diversity of its multicultural food. You always hear that NYC is a melting pot of different cultures but I think Canadians know that Toronto is very similar even if it’s not that well known in the world. I went to the mall I grew up in in Scarborough this weekend and walked around for an hour or two. In that time, I saw a couple of mixed couples (one caucasian) and only group (pair) of caucasian people. The remaining visitors to the quite busy mall were Asian, Indian, African and other races. I’m sure that the demographic is a different downtown and maybe other neighborhoods in Toronto, but at least in Northeast Scarborough, you can tell where the renown of its food diversity is coming from. To get to the airport for my flight, I tried using uberX for the first time. Usually I don’t get a chance to use it because when I’m in Toronto I have a car to drive around, and when I’m in NYC I prefer to walk. But I’ve taken Uber a couple of times so it’s not entirely a new experience. What struck me as new about this one was that it was a youngish (20s? ), immigrant (I can tell by the English facility) driver with a new car. The plate started with BW so it must be new (I have only seen BV cars up until now). For someone who is unskilled or not able to get a job in the workplace, this seems like a good foothold to make some money (although I don’t know how much money they actually make after Uber’s cut). You can start a corporation, expense your car lease, gas and smartphone expenses, make money AND get a new car to drive you or your family around when needed. I’m not sure how long their work days are though – the trip from home to the airport only cost me $29 and that’s with the driver stopping for a few minutes to get gas! We didn’t get Fall this year as we basically jumped from Summer to Winter in October. Days are in the 10°C range and there was frost on some nights. The heat had to come on so there was no time to open the windows. We want to some farms for some fall activities and some of the farms lost their PYO crops due to the frost! There was a bunch of interesting news this month. The municipal election concluded this month and Toronto has a new mayor in John Tory, who beat out Doug Ford (who had to step in to replace incumbent Rob Ford after he had to pull out due to cancer treatment). It sounds like city politics will be a lot more boring in the next 4 years. The CBC sacked Jian Ghomeshi who fired back with a lawsuit, which resulted in a number of women raising abuse complaints against him. It sounds like he was prepared for this though as his lawyers and PR firm were right on it (although he was later dropped). The SF Giants won the World Series for the 3rd time in 5 years, but I think the larger story was the wildcard run of the Kansas City Royals. Unfortunately, they were not able to win it all. Apollo grew a bit too much in the last year so some of the costumes we tried on last year that were “too big” didn’t fit him this year. Instead, we had to go buy a couple of new costumes for his Hallowe’en engagements. We also had to buy a couple for Jovian since he’s too small to fit in Apollo’s costumes from last year. 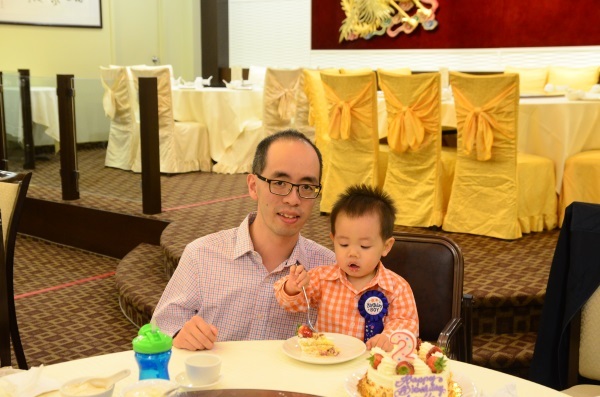 It was also Apollo’s birthday this month and he enjoyed eating cake unlike his first year’s birthday. There are always arguments about whether we’re in a real estate bubble or not, but I suppose it doesn’t matter to me much since I’m invested in the market – i.e., if the market goes up then when I sell I’ll make more money, but it’ll cost me more to buy the next house. That philosophy is kind of fine, except that the rate that property values are increasing seems to be much higher than the rate of salary increases. In a recent Globe and Mail article, the Toronto neighborhood with the highest property value increases is my neighborhood, Willowdale. From July 2009 to July 2014, the average house value increased 90% from $667k to $1,270k. That’s a yearly growth of 14.1%, and I don’t think most salaries increase that fast (and every year). The second highest neighborhood is Newtonbrook (just to the west of us) and the third highest is my old stomping grounds Agincourt. They are all above 10% year upon year. Those numbers seem crazy to me! For perspective, in 2013 the average Canadian salary is under $50k. Looks like Toronto is going to become a SF or NYC. Last Friday, I had the lucky opportunity to participate in the CODE Hackathon grand finale because A Healthier Commute was one of the top 15 apps that came out of that competition. This was going to be tough because I’m not good at public speaking and now I had to present to a bunch of important people. I spent the week before perfecting my pitch. It had to be under 4 minutes and included one of my recent videos so really, I only had 2:45. I wrote up my pitch, practiced it, realized it went over time and cut cut cut. I really do think that from initial conception to delivery, I practiced it 100 times. So with everything prepared, then came the day to actually do it. The organizers gave everyone an opportunity to do a dry run a few hours before the actual event which I took advantage of. I arrived and quickly realized that my slides and screenshots were messed up because I had designed for 16:9 but the display was 4:3. That sucked, but I had a few seconds to fix up some of the text. My dry run went alright, but I was a little over time. 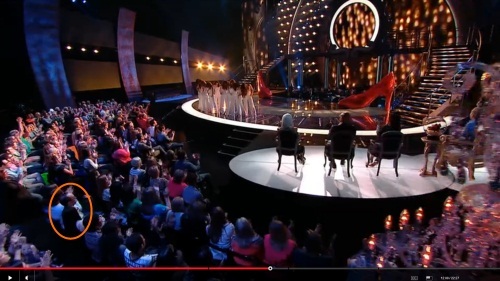 Next was the hard part – the long wait before actually speaking. There was about a 2 hour wait, and there’s nothing much that I could do during that time (I didn’t think I needed to practice anymore). The teams before me delivered error-free pitches (at least I couldn’t tell) and then it was my turn. To tell you the truth, I went on auto-pilot and relied on my practicing. I don’t remember what I actually did, except I know that I screwed up in (at least) 2 places: 1) I forgot to say one line (but it was repetition/support) and 2) I forgot to advance the animations on my slide until near the end (wasn’t too bad, but wanted to give audience more time to read). I might have screwed up in other places but I really can’t remember so I’ll have to wait to watch a tape. I’ve seen him a lot on Dragon’s Den and he is a celebrity. One more photo to add to my with-celebrities album! Although it didn’t feel like it, we finished our Christmas shopping relatively early this month. Between our trip to Grove City for Black Friday and online shopping, we hardly had to go to the mall. This was useful, because a couple of days before Christmas, Toronto was hit with a severe ice storm which knocked out power throughout various parts of the city. We lost power at home for 108+ hours which meant there was no hot water or heat either. We stayed at home for the first two nights but as the temperature dwindled down to -12°C, we stayed over at Pauline’s parents who still had power. Driving around Toronto during the ice storm aftermath, especially at night, was really dramatic. Seeing numerous condominium buildings standing in the dark, completely void of light, seemed like we were in an apocalypse or zombie movie. This was by far the news story with the most impact of the month, even pushing Rob Ford out of the limelight (except for this duties as the mayor in a time of crisis). Christmas itself was not very lively. I attribute this to not having to go to malls much during the month, and just in general, not being outside. When you’re not exposed to the mass marketing of Christmas cheer, you won’t get influenced to be in the spirit! Instead, the holidays just felt like a few days off. I didn’t take time off except for the statutory holidays over the break. It wasn’t too bad working though. As you might expect, a lot of coworkers were on holidays and there were no pressing deadlines. Plus, we hadn’t planned any trips to go anywhere during the break. Instead I used some of the down time to do some blogging (end of year stuff), and continue preparing Apollo’s room. Over the Christmas break, we went down to the Rogers Centre Skydome to see the annual Disney on Ice. This was our first time, and luckily we have a kid with us now because if we didn’t, we would look really odd. This was primarily a kids event, with lots of girls dressed as princesses and lots of boys brandishing swords. It is basically a collection of your favorite Disney classics that feature prince and princesses; such as Cinderella, Sleeping Beauty, Snow White, Beauty & the Beast, the Little Mermaid, Aladdin, Rapunzel. Each classic had a choreographed skate, usually a pairs dance, but sometimes just a single performer and backup skaters. Some of the acts were more intricate than others (such as the Little Mermaid and Aladdin), and some had cool props like a Dragon that breathed fire (Sleeping Beauty) or Cinderella’s pumpkin carriage. The skating was pretty good, a couple of falls although you wouldn’t expect any quads (I think there were one or two triples, but I’m not an expert). 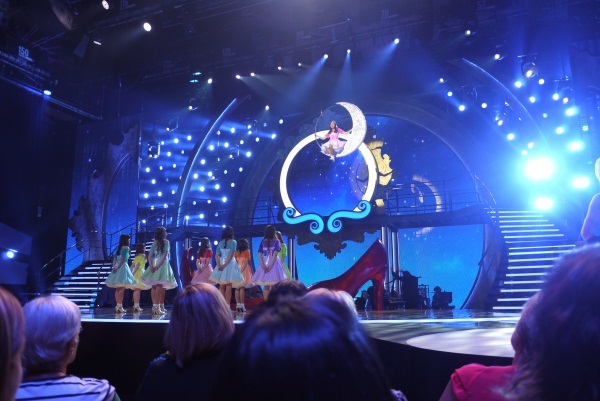 I imagine it would just be cool for kids to see their prince or princesses moving so smoothly. I liked how some of the skaters had to wear intricate costumes (such as a spoon, fork, and knife sticking out of their back for the Beauty & the Beast act) – you don’t see those types of costumes on TV. We got a good deal on the tickets so they ended being less than $20 each. Parking was more expensive because we saw that matinee show (4pm) so we had to pay for 9-5 level parking downtown. But it’s pretty affordable to bring your kids down to see every year. We started September on vacation in Asia and didn’t get back until the 17th. I was hoping that since we were in Asia in September this year (in the past we would go in August), it would be cooler – but it was actually just as hot (if not hotter) than August! Except for a couple of days in Busan, the temperature was above 30°C every day! We were in for a shock then, because when we returned to Toronto the temperatures were in the mid-teens! Autumn had arrived indeed. The two week vacation was a vacation for Apollo as well as he took a break from advancing. Before our trip he had started taking his first steps, but then he regressed since he didn’t get to practice walking much while away. He has since improved and can walk from the living room to the kitchen by himself (without falling). The big news in Toronto after we got back from vacation (who knows what happened while we were gone) was the talk of the subway extension into Scarborough. Both the federal and provincial governments have committed funds to the project so it might actually see the light of day. For someone who had to ride the LRT and then transfer at Kennedy for many years when I was a teen, this is great news. For the other areas of the city that were hoping for a transit line (light rail even, not a subway), not so much. Toronto made the headlines around the world this month when Rob Ford was rumored to be captured in a video smoking crack cocaine – I even saw a report in an elevator when I was in New York! Naturally, the entire Toronto media was chasing and covering this story during most of their air time. The story was also fueled by the fact that the owner of the video wanted $200,000 to release the video (with an online campaign run by Gawker raising money), and that one one of the people in the video was shot and killed around the time the news of the video came out. The fallout including 6 staffers (so far) resigning or being fired for the mayor’s office. The story is still going and we don’t know whether Rob Ford did or did not smoke crack (he hasn’t outright denied it). When I was watching that, I watched a hockey playoffs on CBC. Because of the lockout, the playoffs are going really late into the year, we’ve only gotten to the conference finals by the end of May! I made my monthly trip to NYC but this time, Pauline and Apollo came with me. On one day, Apollo went on his first: boat ride, plane, got his first stamp in his passport, monorail ride, train ride, and subway ride! That’s almost every form of transportation there. The weather was better (warm but not too much) so we went to a couple of parks in Toronto during the weekend and started taking photos again. You get real glass for your on board drink, and you can also get complimentary beer or wine! By the way, YTZ also has Air Canada flights, but for whatever reason they only fly to Montreal! AC might as well not fly out of YTZ. I feel like I owe it to my blog to write a bit about hockey. Yes, an agreement was reached in the lockout earlier this week, before the drop dead date where the season would be cancelled. How convenient for all parties involved. Some stars started coming back from Europe, and some decided to stay a bit longer (for the KHL ASG at least); and the clubs, players, media, restaurants & bars, and fans started preparing for a shorter 48 game season. There was a lot of activity on the web about various team’s chances to make the playoffs because the effect of an injury or a hot streak is much more pronounced in a short season. But as I mentioned in my other blog, I’m not that excited because I’m not that fanatic about hockey anymore. But what was interesting this week was the bombshell that the new owners of MLSE (Rogers & Bell) dropped on the NHL world on the same day that the NHL apologized to its fans for the lockout. With seemingly no warning or cause, Brian Burke was fired from his roles as President and GM of the Leafs. I don’t think Brian Burke has been a savior for the organization, certainly the Leafs still struggled in his four year tenure as GM; but the roster has been completely overhauled and there certainly is a more promising atmosphere surrounding the team. He has made bad trades and signings, but he has also made a couple of exciting, blockbuster trades. He has also contributed a lot to Toronto culture by being a spokesperson for gay rights. Rumor has it that he had until the NHL ASG time frame to make sure the ship was going in the right direction for this year’s team (i.e., making the playoffs) and the continuation of that rumor was that he was fired now because it is around ASG time; although it is a bit unfair since the Leafs haven’t played any games this season, and he was unable to make any personnel moves with the lockout in progress. Another rumor is that the reason for his firing was personal because his replacement at GM has been his right-hand man for several years (so the Leafs aren’t changing course), and because he had a full schedule the day before and the day he was fired. That seems like the most likeliest explanation but hasn’t been confirmed; so I’ve been glued to the blogs this week waiting to hear for confirmation or otherwise. Still haven’t heard it, but this drama is more interesting than hockey itself! A few months ago, I received a flyer in my Toronto Hydro bill about their new peaksaver PLUS program. For free, they would install a meter so that I could monitor my energy usage. Since it was FREE! I signed up and they came by to install it last week. But just as how the upgrade from CFL bulbs to LED would have been a net loss in savings, I think this program is running a net loss and doesn’t make a lot of sense. The device is a couple of wireless transmitters that were attached on my energy meters, and a in-home display. The transmitters transmit energy usage and the display summarizes and aggregates the information. Basically it works like one of those screens that display the weather. It’s made by Blue LIne Innovations which is a Canadian company and retails for $109. Add in the cost of sending a guy to install the device and various overhead, and I wouldn’t be surprised if the cost per household is about $150 – $200. On the product’s website, the promotional materials say that these devices help homeowners reduce energy costs by 9%; and another page says it will reduce energy costs by $250. That seems to pay for the product by itself, but naturally I am skeptical. 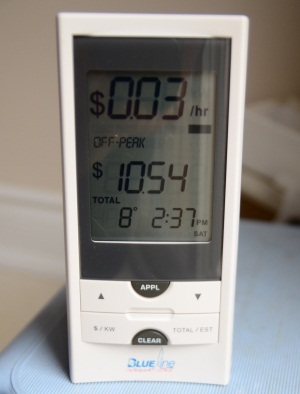 After observing it for a week, the device estimates that I have used about $3 in electricity. So doing some quick math, it would help me save a whopping (52 * 3 = 156 * 0.09 = ) $14. In ten years, the device might pay for itself! Secondly, this number seems plain wrong. I pay approximately $60/mth for electricity (which includes delivery and other miscellaneous charges). That number doesn’t map correctly to $3/week. I think this is either because the device is in sleep mode (and thus not receiving data) or not hooked up correctly. In any case, it is difficult to find incentive to reduce energy usage when it is only a few pennies per hour! Finally, there is only a single device (which we currently have in our kitchen). Seeing the device may remind us to save energy – but only when we’re in the kitchen. There are a lot of other energy sinks so where are the reminders for those items? I think Toronto Hydro received or allocated an amount of funding to energy reduction, and this is one way they are using their money. It’s certainly fun to have one of these devices for free; but I don’t think they will recoup their investment in energy savings. 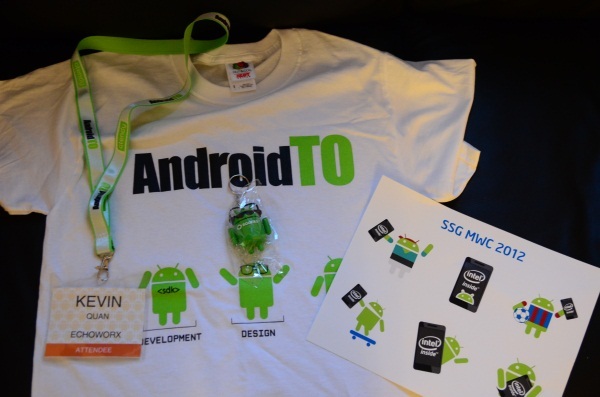 For the last two years, there has been an Android conference in Toronto which I didn’t really know about. But this year, the third year, I found out about it and went as part of a work event. AndroidTO was a relatively small conference with about 800 attendees in 2011. I think there were about as many people there this year. 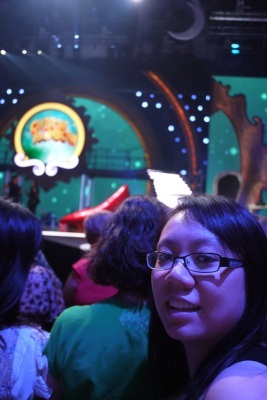 The event was hosted at the Scotiabank Theatre in downtown Toronto, and all the attendees fit into the largest theatre (while it wasn’t “sold out” seating, it was comfortably full). There were three tracks, one each for developers, designers, and business folks with speakers from various large companies (Google, Adobe, Tumblr) and some smaller, local ones (Kobo). Only thing missing is a free ice cream sandwich from Kobo. The swag part was actually a disappointment, but there just weren’t a lot of booths that showed off products or were giving out cool things. These are my check-ins grouped by the number of unique places I’ve visited in an area. 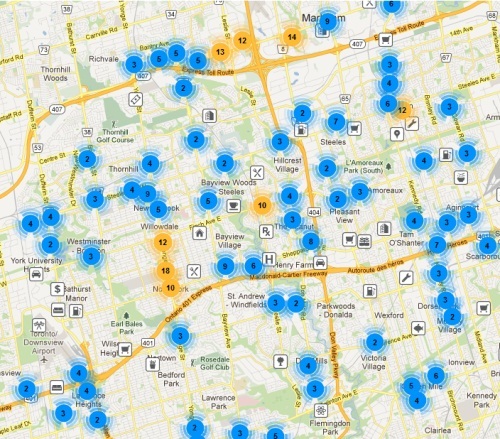 You can see that I visit many places on major arteries and many around Hwy 7 and Yonge. When I went looking for a map generator built with the Foursquare API, this wasn’t quite what I had in mind though – I wasn’t just interested in unique places, I wanted to see the frequency of my check-ins mapped. 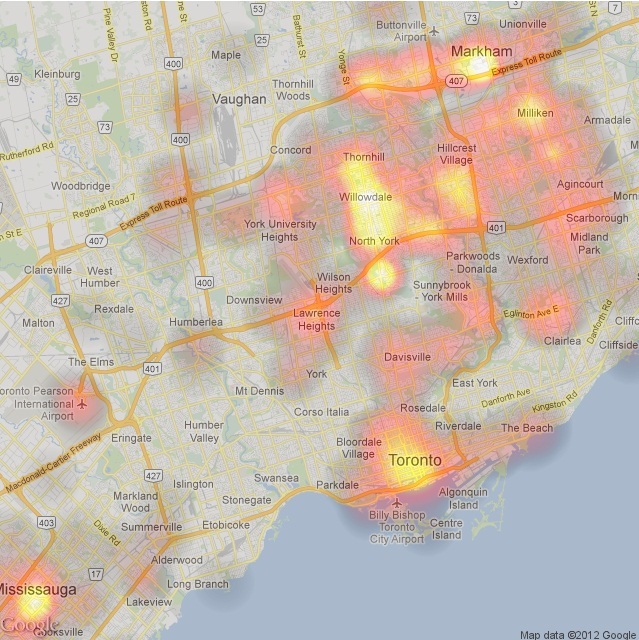 This is a nice summary of where I frequent now, a couple of old homes/workplaces and a couple of neighborhoods like Yorkdale, the Beach, Yonge/Eglinton, and Leaside. I wish there was a larger dynamic range though. I was in between American Express cards for awhile, but I got a new one just in time earlier this year to secure Front-of-the-line tickets to this year’s (or may be it was last year?) Coldplay tour. I then filed it in my calendar and promptly forgot about it until this week when they played the first of two nights at the ACC. Mylo Xyloto was an ok album. I really liked the Every Teardrop is a Waterfall (#1 on my 2011 list) but the rest of the songs were only average. So I wasn’t really excited about the concert; but the good thing about Coldplay now is that they have a solid back catalog of hits – their concert ended up being about half the songs from Mylo Xyloto and then all their hits. We got there a bit early, and caught both parts of both openers. We heard a few songs by Emile Sandé of which the last “hit” I had heard before (Next To Me). But I had never heard of the second opener, Maria and the Diamonds, before. She frankly sucked as it was mostly upbeat and weird pop music. I’m not sure why she was an opener, because I don’t think the (starting to age) fans of Coldplay enjoyed or will be interested in Alice Deejay-esque dance music. Then Coldplay hit the big stage with their ~20 song set. They put on a show (lots of things in the air, and everyone was part of the concert with Christmas light wrist bands) and I can’t say that it was bad, but it wasn’t that great either. It really felt like Chris Martin was dialing it in, and his shout outs to the crowd were horrible (that was to be their “best” concert for the “best” fans). In fact, I think the only moments when he was sincere was the two times he messed up. I can’t really blame him though, after touring so many times and 75% through the current tour. I recently realized that I never blogged about the result of the Stanley Cup final! It was just forgetfulness rather than embarrassment because I picked the right winner. I’m quite happy for the LA Kings to win it. They have had an exciting and young team for several years, and I am glad that Mike Richards and Jeff Carter teamed up to win the Cup after being shockingly traded a year ago. That pick put me over .500 with a 8/15 final record. I blogged about the Stanley Cup so late, that the draft passed too! Toronto had the 5th pick which was promising because that pick usually yielded a decent, if not amazing pick. Kessel was a #5 pick. Toronto’s last #5 pick ended up being Luke Schenn. Toronto has been looking for a #1 center for the last few years, and picking early gave them an excellent opportunity to grab one. When it came our turn, there was still a center left (Grigorenko) and another promising forward (Forsberg). We ended up taking a defencemen (Reilly) and I was quite disappointed about that. The Leafs already have a great number of young, promising defencemen (Schenn, Gardiner, Blacker, Holzer, Gunnarssson, Franson, Percy) and a number of older defencemen signed for several more years (Liles – 4 years, Komisarek – 2 years, and we’re not trading our Captain Phaneuf). We might end up winning the Schultz sweepstakes as well. What are we going to do with a logjam on defence? I would have rather we bet our pick on a high skilled, potentially elite forward. Then, after our controversial pick, the next 5 picks were also for defencemen! That’s 8 defencemen in the first 10 picks. I don’t think that has ever happened before. Time will tell whether that was a good idea or not; Grigorenko and/or Forsberg might be this year’s Cam Fowler and Sean Couturier.